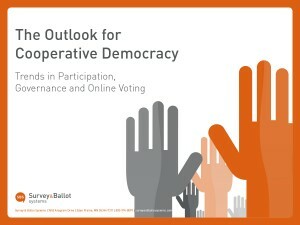 Is your cooperative up to speed on the latest trends in elections, participation, governance and democracy? All are vitally important to cooperatives (and their members) everywhere. Tim Madsen, Senior Marketing Manager, and special guests Leslie Watson and Joel Kopischke from CDS Consulting Co-op will get you up to speed and answer questions you may have. Join us Thursday, October 8 at 10:00 am CDT for this free webinar packed with valuable information for your co-op.